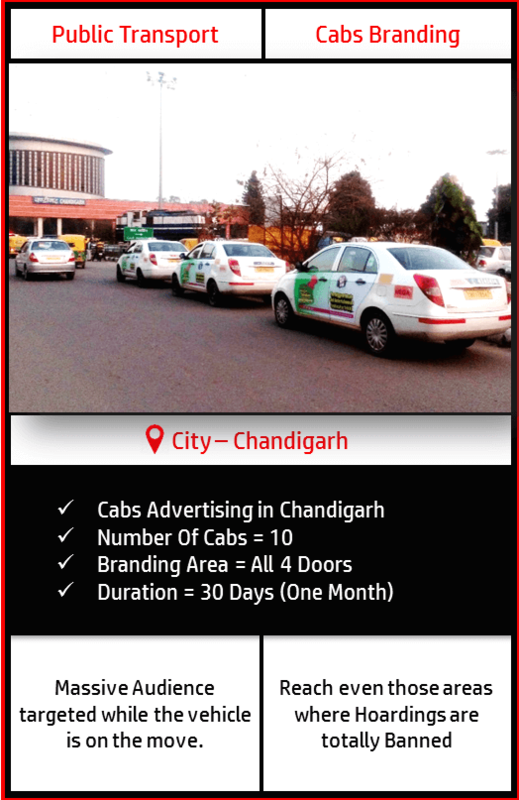 Moving Cabs Advertising in Chandigarh Tri-City covering each Nook and Corner of Chandigarh, Mohali, Panchkula. 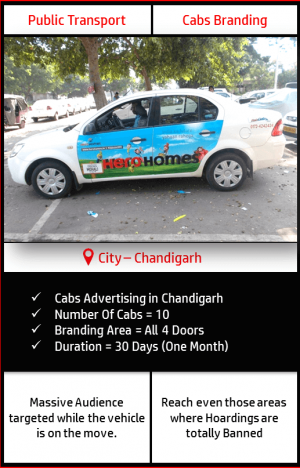 All 4 Doors of the Cab will be covered with client’s Branding. 10 Cabs Campaign covers the Entire city which ensures a massive brand hammering. One time Printing & Installation is absolutely free as an Add-on Benefit with the package. The availability of this exclusive medium depends upon the time of booking. Once the campaign is locked, it can’t be stopped in between. 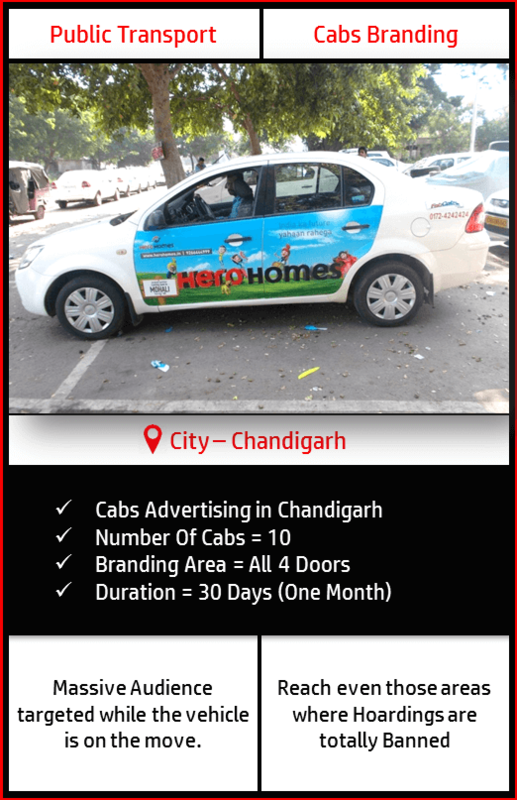 Branded Cabs images will be shared prior Campaign startup. After the execution of campaign BMK will share the Images with complete information i.e. Registration No., Number Plates etc. . The client needs to intimate BMK 7 days in advance anyhow creative needs to be changed. The client itself would have to bear all the costing required to change in creative. The exact dimensions would be shared with the client at the time of booking. One time Printing & Installation is absolutely free and an Add-On benefit with the Package. Public transport i.e. On The Move advertising ensures that each and every segment of the entire population will be targeted. 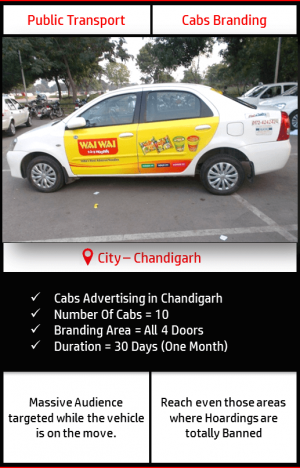 Public vehicle stand on the most crowded Place of the City which enables a broader reach of your brand to he massive audience even when the vehicle is in static condition. To avoid the clash of unavailability among limited outdoor advertising mediums, either in terms of excess rates or timing, mobile hoardings act as a boon to eradicate all the hurdles in the way of prestige building. 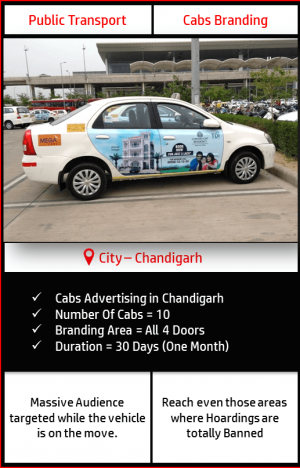 The dynamic Printed Cabs Advertisement Lays an eye Catching impact on the viewers mind which consequently grabs the attention of massive road users. The huge audience targeting Capacity makes this source as one of the cost effective advertising medium . 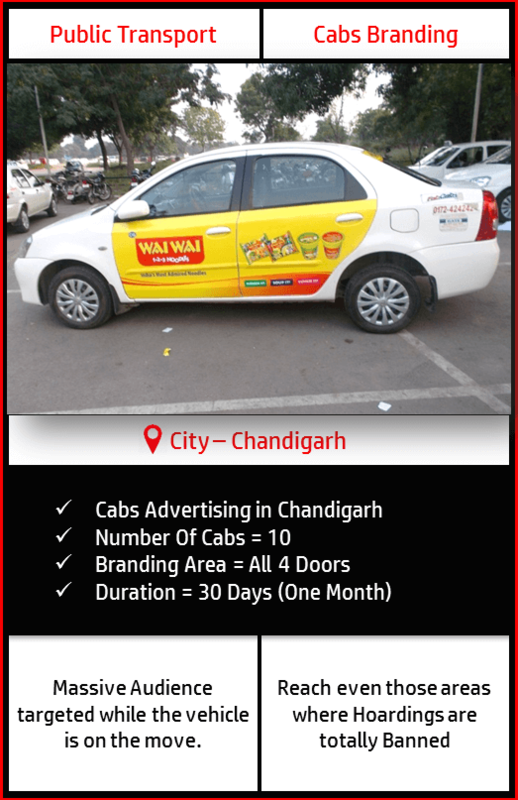 The quite flexible medium providing facility to display multi-ads of a single Brand on different Cabs. Very flexible in terms of duration of the campaign (Recommended for small campaigns as well).